Better than expected data out of China has given risk appetite a boost again. Growth in the world’s second largest economy is crucial for commodities and positive China data is positive for risk appetite. 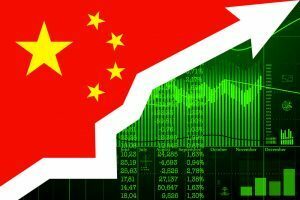 China Q1 GDP came in better than expected at +6.4% in Q1 (+6.3% exp, +6.4% in Q4 2018). China has been engaging in both fiscal and monetary stimulus to help protect the economy from a hard landing. It seems to be paying off. China Industrial Production jumped to 8.5% (+5.9% exp, +5.3% in February), whilst China Retail Sales also improved to 8.7% (+8.4% exp, +8.2% in February). Both major sectors which depict the old economy (Industry) and new economy (the consumer) are finding support. Markets are responding and traders are moving out of safety. Bond yields are higher, whilst the yen and the US dollar (both perceived as safe havens) are underperforming. The Chinese yuan strengthening is also playing into the dollar weakness today. In another nod to the stronger China data, oil is also more positive. In the forex space, the Australian dollar, hit yesterday by dovish RBA minutes, has jumped. The Aussie is seen as a proxy for Chinese economic prospects. It will also be interesting to see how equity markets fare today. Recent days have been driven by US earnings season, but market moves from the China data should be positive for equities. It will also be interesting to see how gold holds up too, as after yesterday’s selling pressure, gold is on the brink of a key breach of support. Wall Street was tentative yesterday with the S&P 500 +0.1% at 2907 whilst US futures are edging higher by +0.1% today. Asian markets have been mildly positive (Nikkei +0.3%, Shanghai Composite +0.5%). In Europe, there is more of a cautious look to the open, with FTSE futures -0.1% and DAX futures flat. In forex, the dollar underperformance is helping the euro rebound, whilst the Aussie is the main outperformer around +0.3% higher. The New Zealand dollar is not joining in though after quarterly inflation missed expectations. In commodities, gold is in focus after yesterday’s sell-off, with the yellow metal a couple of bucks higher. Oil is also positive today, eyeing recent consolidation resistance. UK inflation numbers at 0930BST are first up on the economic calendar. UK headline CPI is expected to tick slightly higher to +2.0% in March (+1.9% in February), whilst core CPI is expected to also increase to +1.9% from +1.8% in March. The final Eurozone HICP for March is at 1000BST and is expected to show headline HICP confirmed at +1.4% (+1.4% flash), with core HICP expected to be confirmed at +0.8% (+0.8% flash). The US Trade Balance for February is expected to show the deficit widened to -$53.5bn (-$51.1bn in January). EIA Oil Inventories are at 1530BST and are expected to show crude stocks in drawdown by -1.2m (from +7.0m last week). It will also be interesting to see what the Fed’s Beige Book has to say at 1900BST. Increasingly positive risk appetite is not doing well for the Swissy. USD/CHF has been trending higher for the past three weeks and looks set for a full retracement to the 1.0128 November high. Momentum is fully positively configured now with the RSI rising above 60, MACD lines pulling above neutral and Stochastics strong. Intraday corrections are a chance to buy with the uptrend supportive at 1.0015 today. 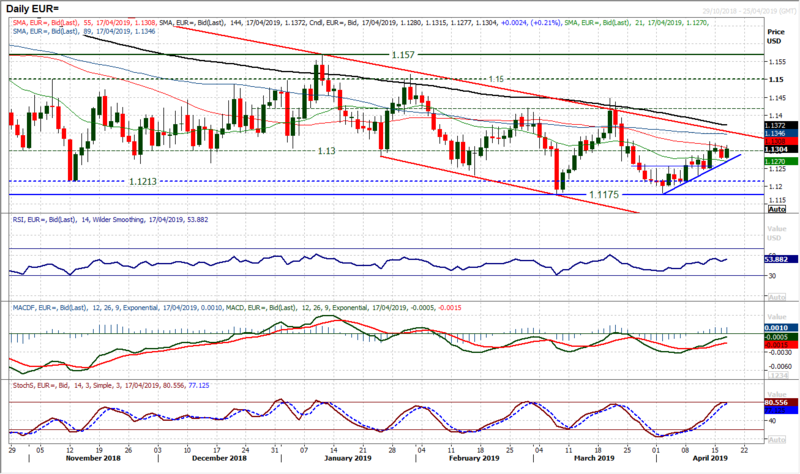 The latest break above 1.0050 means that the next real resistance is not until 1.0128. The breakout support around 1.0050 is now initially supportive today. The reaction low at 0.9993 is key near term coming around the 23.6% Fib retracement at 0.9990. The uptrend of the past two weeks continues to flank the recovery. Once more a negative candle has been quickly followed up by an early rebound today. This has kept intact the trend higher and the recovery. However, this move higher needs to continue now, as essentially in the past three sessions the market is beginning to drift lower. Since last week’s high of $1.1325 the market has posted successive lower daily highs. This is starting to drag on momentum, with a slight tailing of Stochastics. The concern is that this is happening at a similar position (c. 80) to where the March rally failed. Given the overnight bounce from $1.1280 this support really needs to hold now. The hourly chart is trending higher and posting positive signals on the hourly RSI and MACD need to be maintained. Key near term support is at $1.1250 and a breach would resume the selling pressure. 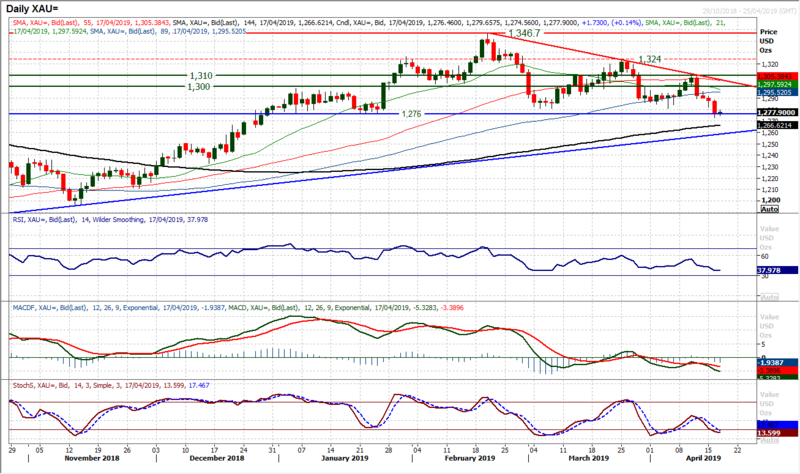 Above $1.1325 opens the medium term channel high at $1.1355. In the past few sessions we have been discussing about the squeeze in the converging trend lines. With a significant drop off in volatility on Cable, this squeeze is still ongoing. There is now just 60 pips between the five week downtrend and four month uptrend. And still the market has not broken either. Even though the Average True Range continues to plummet (now just 94 pips with the mean of the past 12 months being c. 110 pips), expect the trends to be breached today (or tomorrow at the latest). However, a breach will still not likely be a directional move, just continued consolidation. Yesterday’s negative candle put a pin in any positive bias and momentum indicators are stagnant. We still look for a decisive move to come from a closing breach of support at $1.3000 or resistance at $1.3200. 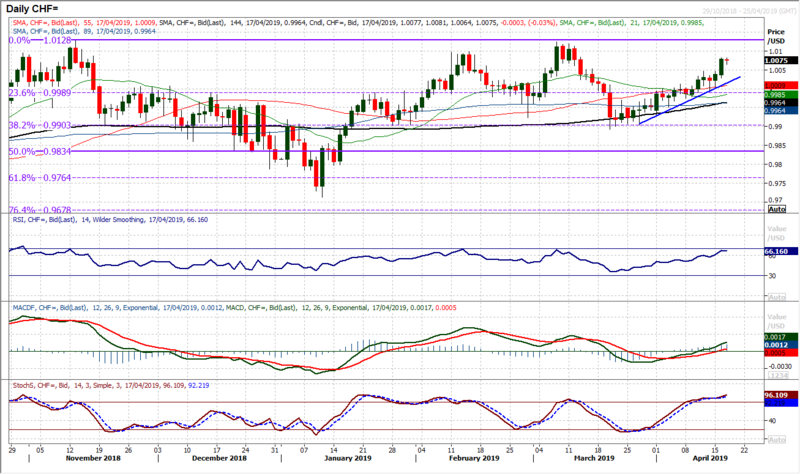 Initial support is at $1.3030, with resistance at $1.3120/30. Conviction is sadly lacking here now. Dollar/Yen continues to bump up against the ceiling of resistance between 112.10/112.30. For the past two completed sessions, this resistance has been tested but remains intact. An early move again today has been rebuffed. There is a slight positive bias on momentum which hints at a preferred breakout, however, it is tough going for the bulls. 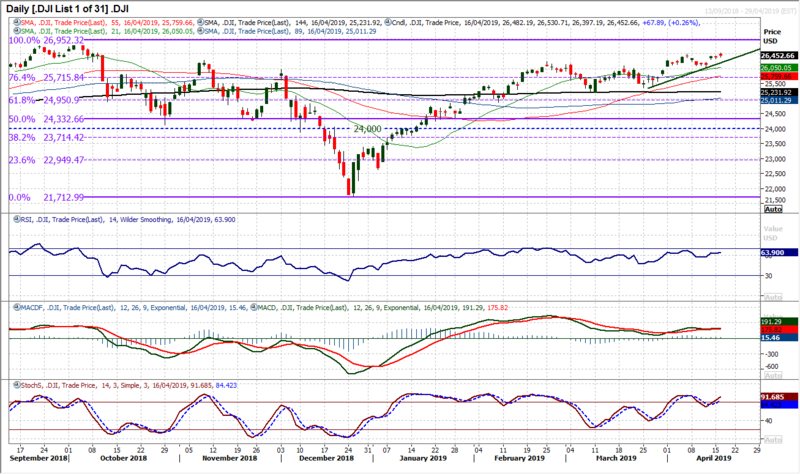 RSI is stuck at 60, MACD lines lacking verve, whilst Stochastics have tailed off again. A closing breach of 112.30 would clear the February/March highs, but also overhead supply of November/December lows. It would then open the way towards 114/114.55. The hourly chart shows that support at 111.80 continues to hold, whilst hourly RSI and MACD lines are unwound and primed for renewed upside potential. A move below 111.60 would suggest the bulls are in retreat. The three week uptrend comes in at 111.50 today. With risk appetite improving, the selling pressure on gold continues to ramp up. For months there has been a basis of support between $1276 (January low) and $1280 (March/April lows). However yesterday’s intraday breach of $1276 really increases the threat of a breakdown. The bulls clung on into the close and a closing breach of $1276 was averted, however, the threat remains. A completed key breakdown would take gold to its lowest since December and a big top pattern. Momentum indicators have been deteriorating for a while now and with the MACD and Stochastics accelerating lower into negative configuration there is further downside potential. The RSI below 40 is also leading the market lower. There is a degree of unwind this morning and it will be interesting to see how the old support at $1280 is treated. This should be a basis of overhead supply now. In fact there is a near term sell zone now $1280/$1290. Any failed rally is a chance to sell. The hourly RSI is failing consistently now between 40/50. 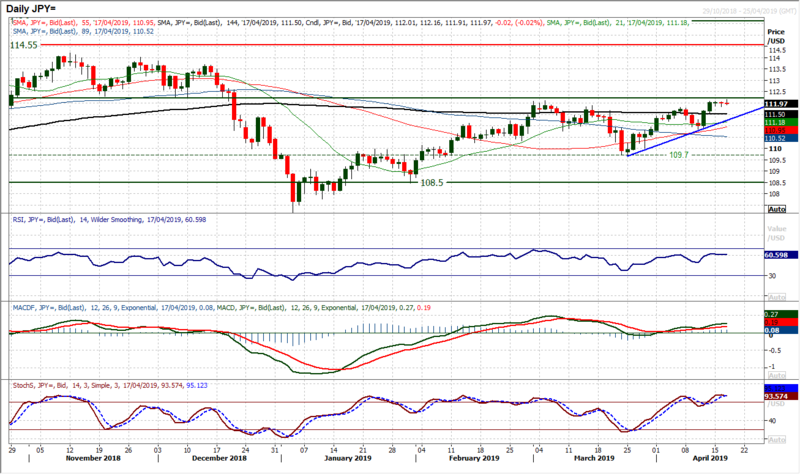 Oil has been in consolidation for the past week as the market has drifted back to the latest breakout at $63.00. This has allowed momentum indicators to unwind which should help renew upside potential. 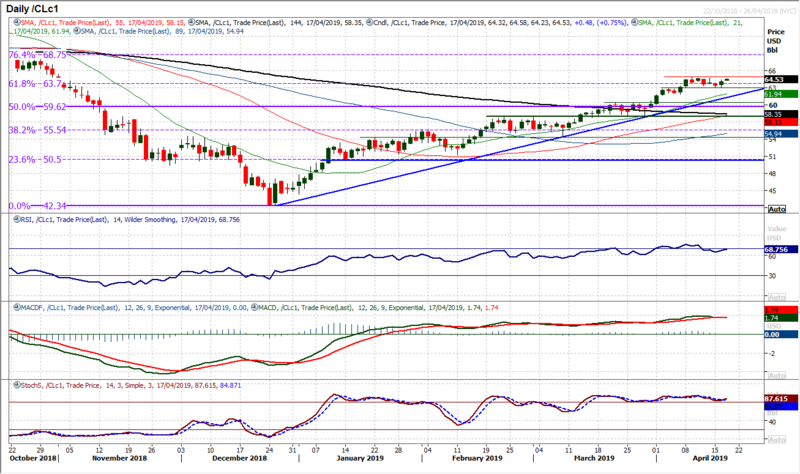 The RSI has tended to find a low between 55/60, whilst the Stochastics remain positive above 80. Now, with yesterday’s positive candle which found support at $63.00 the bulls seem ready to go again. The fact that in this corrective drift, the negative candlesticks have not built up a head of steam suggests this is another chance to buy. Support at $61.80 remains key near to medium term. The four month uptrend sits at $61.30 today. Renewed pressure on $64.70 and a closing breach opens a move towards the next resistance band $65.75/$68.00. As US earnings season has taken hold, the moves on the Dow would suggest a cautious optimism. Yesterday’s move back to multi-month highs did not come with huge conviction, more dipping a toe in the water. The last two candlesticks have been tentative at best. However, there is a move higher, which is broadly confirmed by positive configuration on momentum. Although the all-out conviction may be lacking still, corrections remain a chance to buy. Initial support is now at 26,310 above the 26,060 support of last week’s low. The market is still on course for a test of the all-time high at 26,952.